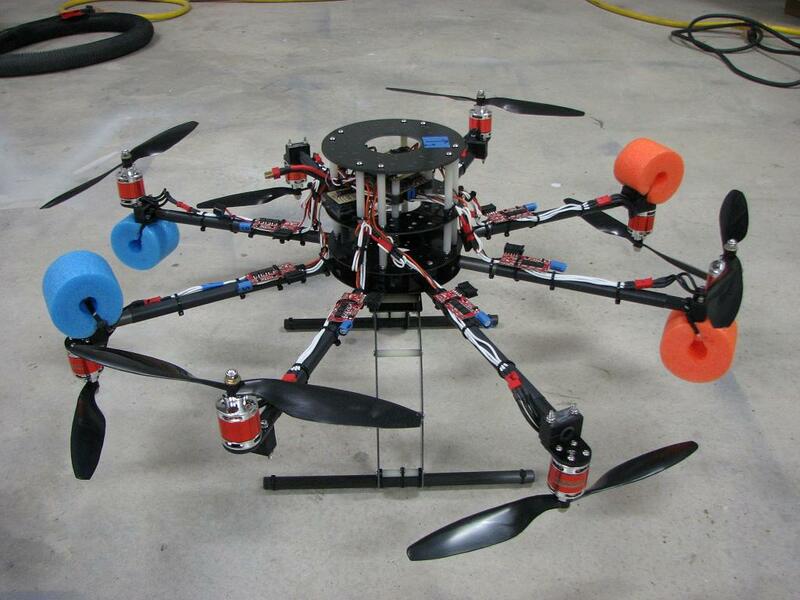 I have quite big octocopter with flat frame cinenestar type with 16" propellers and t-motor u7 420kv motors. It has 120 cm frame size. I would like to change the propellers in it to 18" to have longer flight time. I can use longer booms but the copter will be too big for my car so I am wondering about using the same booms but 4 motors up and 4 motors down like in the picture in attachment. Is that setting is as efficient like flat octo or I will lost same flight time like on coax setup ?? What kind of mixer I should use for such setting ? I am using Mikrokopter FC but I think that will be similar in APM or Pixhawk. Going from 16" to 18" depends also if you are actually with 4S or 6S batteries . Finally you will get a 10% more thrust if T-Motor chart correspond to reality but the propeller weights more so it will less than 10% and has more inertia so if it a good choice depends much if you are already flying close to motor limit or not. No need for any mixer, just put as in photo above three motors upside down. Thanks for answers. I did calculation in ecalc.ch and checked the documentation of the motors so I know that on such configuration on flat octo if I will change propellers from 16: to 18" I will get extra 1 minute of flight time. My problem are this upside down motors they will overlap a little bit with normal up motors so this overleaping will increase the efficiency ? If I will just turn motor upside down it will rotate in different direction so copter wont fly correctly. I have to change also direction of restoration of motor in Flight Controll. The overlapping will cause no problems but I doubt it will increase efficiency . You can change by software the motor direction if you have black MK Esc or last version MK Esc, if you have the red MK Esc it is not possible and you have to switch two motor cables that arrives to Esc to change the rotation direction. What is your AUW, payload and Flight Time ? Octocopter weights about 13kg with camera and gimbal and batteries (2x10 000). It fly around 13 minutes. I have done some maths , not with E-calc, you should hover at 91,6A with a 6S setup . Are you using standard 20-30C Lipo batteries with 3000 g of weight ? In that case I suggest to switch to a different type of batteries , Sony Lion high C discharge , so you can go up to 20 minutes. Yes but that's bigger weight and much bigger price for batteries I think ??? Are they better than tattu ? Do you have any link ? Can I have 12000 or 15000 batt in the same weight as tattu lipo ? Guess that 4 pair of good 18" propellers as T-motor are not cheap. Why not do some testing with the original prop in the original configuration versus the "up/down" configuration, everything else being the same? Not only will you have your answer, but come back here and let us know what the results were. Nothing better than real world results versus theory.